Can You Imagine having Light Show Dive Sticks at your next night time pool party? Can You Imagine tossing your Light Show Dive Sticks into your pool and watching them light up with a multi-colored light show as soon as they touch the water? Can You Imagine your Light Show Dive Sticks automatically shutting off when taken out of the water? We did! Dive Sticks have been a popular pool toy for a long time but not until now did we have the ability to make them light up and create a light show at the bottom of your pool. Great to play with in the day time but AMAZING at night! 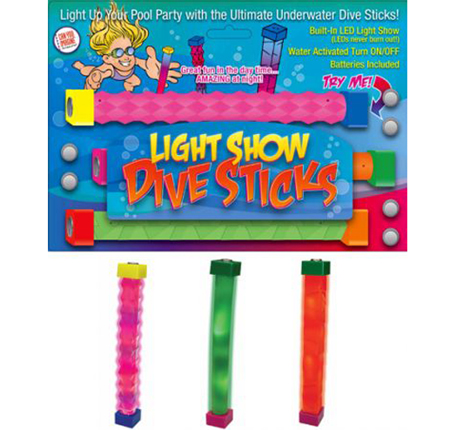 Light up Your Pool Party with the ULTIMATE Underwater Dive Sticks!